The Freestyler is a compact, lightweight, portable workout system that utilizes resistance tubes to provide you with an effective functional movement workout. The Freestyler is especially ideal for women but many men will find it to be a fantastic workout system as well. The Freestyler system is ideal for beginner exercisers as it is very simple to set up and use in the comfort of your own home, it’s fun, and unlike many of the gimmick products you see on TV which claim this and that but don’t give you the results you desire, the Freestyler is a very effective exercise product which when used properly in conjunction with a well-balanced diet will have you seeing real results in no time. Not just for beginners, the Freestyler will be a great tool for many of you veteran exercisers too, especially for those of you looking for a portable yet effective workout system that you can store easily and take just about anywhere. Personal trainers, Pilates specialists, physiotherapists, and dancers may also find some great value in the Freestyler because it is a versatile product that can be utilized in so many different ways. 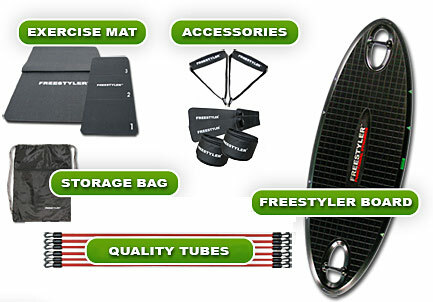 At the time of this review, each standard Freestyler set comes with a fair amount of gear, including 6 quality elastic tubes (Easy and Medium), a storage bag (for the tubes, handles, and cuffs), 1 pair of handles and ankle cuffs, a sturdy base board, and a sweet tri-fold exercise mat all for the low price of $299. However, we do recommend you purchase the Freestyler travel case if you plan on taking the Freestyler unit on the road, because you can easily store everything within for even easier transportability. This is something we wish the standard unit included for it really is a useful addition to the Freestyler system. It can, however, be easily purchased from the Freestyler Store for $49.00, which in all honestly isn’t too bad a price considering the quality of the bag. If you do decide to purchase the Freestyler travel bag, which we highly recommend, you won’t be disappointed. Besides making traveling with the system a snap, you can also easily store everything in the case and tuck it under your bed or in the closet so everything is out of sight when you’re not working out, and easily deployable when you’re ready. Further accessorizing the Freestyler unit is also very easy via the Freestyler store. You can purchase additional tubes in various strengths including high intensity, sport, strong, medium, and easy, plus ankle cuffs, handles, and Pilates straps can also be purchased. Be sure to check the store often, for we are always seeing discounts pop up on new gear. The Freestyler system is quite honestly about as simple to setup and use as we’ve seen, making it the ideal product for beginners, as we mentioned earlier. If you’re looking to get set up quickly to begin shaping, toning, and strengthening your body right away, the Freestyler is for you. To get started, simply thread the desired strength resistance tube through the pulley bar on each side of the sturdy plastic base which acts as the anchor point, and then attach the ankle cuffs to one side of the band and the grips on the other side. Once the base of the unit is set up and you’re ready to begin your workout, attach an ankle cuff around each ankle, grab the handles and begin. The real gem of the Freestyler system is the online video center. 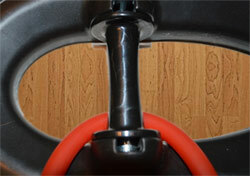 This is where the Freestyler system especially shines for the beginner exerciser. With each Freestyler purchase you are granted access to their huge online video library which when we last we checked contained over 700 videos. You will find videos tailored for specific needs, including but not limited to women’s fitness, strength and conditioning, Pilates, dance, and rehabilitation. Whether you have 10 minutes to work out or an hour, there are a wide variety of videos available. Each video effectively walks you through the movements, provides tips for proper form, and shows you proper breathing when necessary. You are going to find that the Freestyler is very fun to use, which is something many of you will really appreciate, especially if you have any reservations about starting a workout program for the first time or you usually find working out boring. We will be the first to admit the music in many of the videos was a bit cheesy, and the instructor says some pretty darn funny things at times, but in all honesty, the overall experience was fun and effective. All in all the Freestyler is a fantastic workout system for the beginner exerciser, but it also makes a great tool for the veteran exerciser looking for a portable workout system that can be taken just about anywhere. Additionally, personal trainers will find it to be a great addition to their arsenal, as its portability makes it a cinch to take back and forth to client’s homes. If you are looking for a great easy-to-use new workout system that doesn’t require a ton of equipment or come with a high price tag, I highly recommend you check out the Freestyler for yourself. The Freestyler is not only flexible, lightweight, and portable, but it’s highly effective and fun to use.